The thing about body image is it’s not just about how you feel about your body RIGHT NOW. It’s the comment your grandmother made about your size when you were a little girl. It’s the rude name your high school boyfriend called you. It’s how your mom talked about her own body. It’s the example your older sister and aunts set for you by talking about their latest diet and how much weight they wanted to lose before vacation. ALLL that adds up, and creates automatic thoughts that fill your brain with negativity. 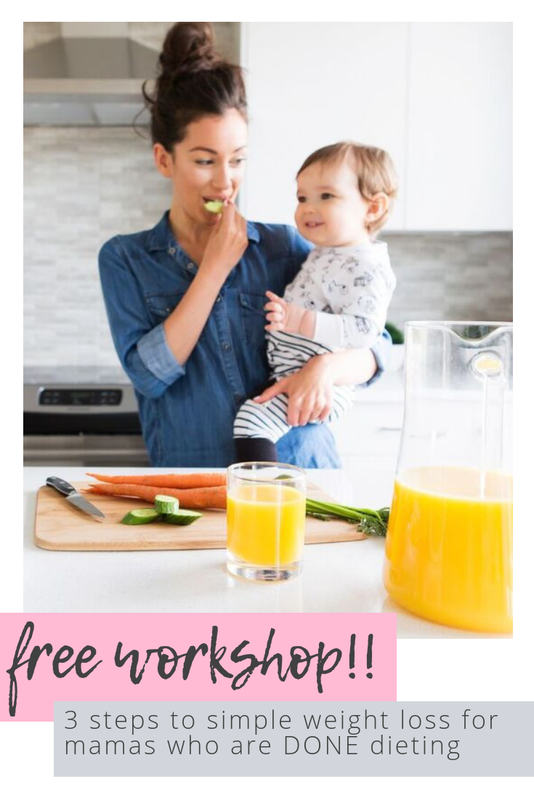 are you a busy mama who wants to lose some baby weight?? Click here. So if you don’t DO the “work” aka learn how to talk kindly to yourself and accept your body as it is NOW…. alllll that junk from your past will be right there with you. Even the rude comments from 20 or 30 years ago! The brain’s job is to create automatic thoughts so it doesn’t have to think as hard. That means when we are in the habit of thinking badly about our body, our brains learn to automaticlly think negative thoughts. It becomes an automatic loop we aren’t even consiously aware of. THAT is why I focus so much on changing mindset about body while also changing nutrition habits. If you are trying to improve your health while thinking horrible thoughts about your body… you might as well be trying to go up a down escalator. It’s just not as effective and may be why you’ve struggled with weight-loss or yo-yo dieting in the past. Do I really expect my clients to go from self-conscious to body LOVE? Not right away, but YES. Loving your body doesn’t mean being self-obsessed. It doesn’t mean loving every inch of yourself every single day. What it DOES mean, is accepting your body as it is right now. It’s okay to want to improve your health, of course, but the point of self-love is to be kind to yourself. It’s about talking to your body the way you would talk to your sweet daughter. It’s about giving yourself grace, and knowing that you’re doing the best you can. It’s about understanding that body “ideals” are damaging, and realizing that ALL bodies are good bodies. Different shapes and sizes and colors is what makes the world beautiful and unique. So if you’re trying to change the way you talk to yourself or talk about your body what should you do?? Pay attention to your thoughts for a few days. Start by becoming aware of what you say to yourself when you look in the mirror, when you try on clothes, after a big meal, etc. Once you become aware of the comments you make to yourself, you can begin to change your thought patterns. After paying attention to your thought patterns for a few days, write down the most common thoughts. Like, actually sit down and write! And then write some more about negative thoughts you’ve had about your body, yourself, how smart you are, etc. Example: my thighs are so big, I don’t fit in any of my clothes, I need to lose weight, I hate my ____, etc. My mom says my ___ is ____…. etc. THEN…. And this is the most important part. Begin journaling a rebuttal or an opposite to each negative thought as well as think about where the thought came from? My thighs are big compared to what?? Do my clothes not fit because I just had a baby? Or because I need to buy new clothes? Or because I gained 10 lbs because of stress in the last month? Why do I hate my ___? Did someone make a comment on that body part when I was a child? Am I comparing myself to someone else? And most importantly… what would I tell my daughter if she made those comments to herself? THAT should be the standard by which we talk to ourselves. (BONUS!!) Once you have your rebuttals write down a few affirmations. You don’t have to go from I hate my thighs to I love my thighs… start with “I’m learning to love my thighs.” or “I have a body” instead of I hate my body. Repeat your affirmations whenever you look in the mirror. Put sticky notes on your car steering wheel on your bathroom mirror, etc. Changing your thought patterns doesn’t have to be complicated. It’s like changing the eating habits you’ve had for years. It takes work, but it IS possible, and it’s amazing what happens when you DO make a change. Are you interested in learning to love and accept your body while also improving your health habits?? 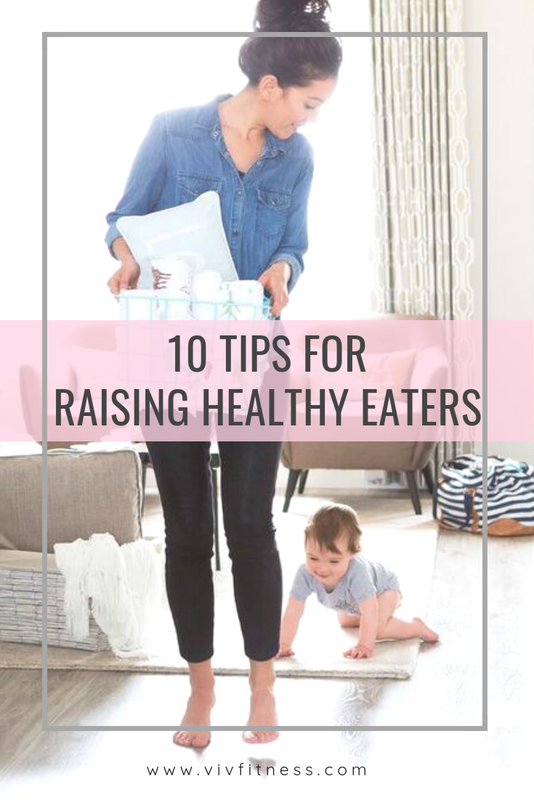 I work with mamas who…..
Know their pre-baby weight-loss methods just won’t work anymore. Having ENERGY to run and play with her kids. No more sugar cravings… one mama said GOODBYE to the afternoon chocolate habit she had for years! Actually enjoy and crave healthy meals. One of my clients stopped the drive through habit! Learning how to balance their favorite treats with healthy foods. ALL of my clients eat the foods they lovein moderation. No restrictions or feeling deprived. Being a healthy example to their kids… the reason you want to be healthy anyway. Learning to love her body. The greatest gift you can give yourself is self-acceptance. Do you want results WITHOUT strict diets or crazy exercise plans you don’t have time for? ?